This article is about the 1998 film involving a "killer comet". For the NASA mission to several comets, see Deep Impact (spacecraft). Deep Impact is a 1998 American science-fiction disaster film directed by Mimi Leder, written by Bruce Joel Rubin and Michael Tolkin, and starring Robert Duvall, Téa Leoni, Elijah Wood, Vanessa Redgrave, Maximilian Schell, and Morgan Freeman. Steven Spielberg served as an executive producer of this film. It was released by Paramount Pictures in the United States and by DreamWorks Pictures internationally on May 8, 1998. The film depicts the attempts to prepare for and destroy a 7-mile (11 km) wide comet set to collide with Earth and cause a mass extinction. Deep Impact was released in the same summer as a similarly themed film, Armageddon, which fared better at the box office, while astronomers described Deep Impact as being more scientifically accurate. Both films were similarly received by critics, with Armageddon scoring 39% and Deep Impact scoring 44% on Rotten Tomatoes, with Deep Impact grossing over $349 million worldwide on an $80 million production budget. It was the final film by cinematographer Dietrich Lohmann. On May 10, 1998, teenage amateur astronomer Leo Biederman discovers an unusual object near the stars Mizar and Alcor at a star party with his high school astronomy club in Virginia. His teacher has Leo take a picture and then sends it to astronomer Dr. Marcus Wolf. Wolf realizes that the object is a comet on a collision course with Earth. Unfortunately, Wolf dies in a car accident on his way to try to alert the authorities. One year later, MSNBC journalist Jenny Lerner investigates the sudden resignation of Secretary of the Treasury Alan Rittenhouse and his connection to "Ellie", supposedly a mistress. After interviewing Rittenhouse, she is taken by the FBI to see President Tom Beck. After this, she finds out that Ellie is really an acronym: "E.L.E." ("extinction-level event"). Lerner's investigation prompts President Beck to make an announcement earlier than planned: the comet, which has been named Wolf-Biederman, is headed for Earth and it is 7 miles (11 km) long, large enough to cause a mass extinction and possibly wipe out humanity. He also reveals that the United States and Russia have been constructing an Orion spacecraft called the Messiah in orbit that will transport a team, led by Mission Commander Oren Monash and including veteran astronaut Captain Spurgeon "Fish" Tanner, to the comet, hoping to alter its path with nuclear weapons. After landing on the comet, the crew plant nuclear bombs beneath the surface, but they are caught in outgassing explosions when sunlight heats up the comet. Monash is permanently blinded by unfiltered sunlight and suffers severe facial burns, while Dr. Gus Partenza is flung into space by an outflow of gas. When the bombs detonate, the ship is damaged by the blast and the team loses contact with Earth. President Beck announces that the bombs only split the comet into two smaller pieces, nicknamed "Biederman" (1.5 miles (2.4 km) long) and "Wolf" (6 miles (9.7 km) long), both still heading for Earth. Beck then imposes martial law and reveals that governments worldwide have been building underground shelters. The United States' shelter is in the limestone caves of Missouri. A lottery selects 800,000 Americans under age 50 to join 200,000 selected individuals, as well as a massive supply of food, genetically viable populations of significant animals, and the seeds of every plant species. Lerner and the Biederman family are chosen, but Leo's girlfriend Sarah Hotchner and her family are not. Leo marries Sarah to try to save her family, but it does not work, and Sarah refuses to leave without her parents. Lerner's mother, Robin, also is not selected due to her advanced age; she dies of suicide soon after the announcement. A last-ditch effort to use ICBMs to deflect the comets fails. Biederman will strike the Atlantic Ocean off Cape Hatteras and generate megatsunamis up to 3,500 ft (1,100 m) high. Wolf will hit western Canada, creating a huge cloud of dust and molten particles that will block out the Sun for two years, killing all life on the surface in a matter of weeks. Leo returns home looking for Sarah, but her family has left for the Appalachian Mountains and are stuck in a massive traffic jam. Leo catches up to them on a motorcycle. Sarah's parents tell Leo to take Sarah and her baby brother to high ground. Meanwhile, Lerner gives up her seat in the last evacuation helicopter to her friend Beth and Beth's young daughter. She joins her estranged father, Jason, at their family beach house, where they reconcile. Biederman hits the water, creating a megatsunami that destroys the Eastern Seaboard of the United States. Lerner, her father, and Sarah's parents are among the thousands that are killed by the massive wave. Leo, Sarah, and her baby brother are able to reach the higher grounds of the Appalachian Mountains safely. Unable to safely attempt a second landing, the crew of Messiah decide to obliterate Wolf by undertaking a suicide mission. After they say goodbye to their loved ones by video conference, they fly directly into a large deep crevasse created by out-gassing, using their remaining nuclear warheads to blow Wolf into smaller pieces that burn up harmlessly in Earth's atmosphere. After the waters recede, President Beck speaks to a large crowd at the U.S. Capitol as it is being rebuilt, encouraging them to remember and honor the heroes for their sacrifice. The origins of Deep Impact started in the late 1970s when producers Richard Zanuck and David Brown approached Paramount Studios proposing a remake of the 1951 film When Worlds Collide. Although several screenplay drafts were completed, the producers were not completely happy with any of them and the project remained in "development hell" for many years. In the mid 1990s, they approached director Steven Spielberg, with whom they had made the 1975 blockbuster Jaws, to discuss their long-planned project. However, Spielberg had already bought the film rights to the 1993 novel The Hammer of God by Arthur C. Clarke, which dealt with a similar theme of an asteroid on a collision course for Earth and humanity's attempts to prevent its own extinction. Spielberg planned to produce and direct The Hammer of God himself for his then-fledgling DreamWorks studio, but opted to merge the two projects with Zanuck and Brown, and they commissioned a screenplay for what would become Deep Impact. In 1995, the forthcoming film was announced in industry publications as "Screenplay by Bruce Joel Rubin, based on the film When Worlds Collide and The Hammer of God by Arthur C Clarke" though ultimately, following a subsequent redraft by Michael Tolkin, neither source work would be credited in the final film. Spielberg still planned to direct Deep Impact himself, but commitments to his 1997 film Amistad prevented him from doing so in time, particularly as Touchstone Pictures had just announced their own similarly-themed film Armageddon, also to be released in summer 1998. Not wanting to wait, the producers opted to hire Mimi Leder to direct Deep Impact, with Spielberg acting as Executive Producer. Although publicised as an adaptation of his novel both before and after the film's release, Clarke was disgruntled about not being credited on the film. Jenny Lerner, the character played by Téa Leoni, was originally intended to work for CNN. CNN rejected this because it would be "inappropriate". MSNBC agreed to be featured in the movie instead, seeing it as a way to gain exposure for the then newly created network. Director Mimi Leder later explained that she would have liked to travel to other countries to incorporate additional perspectives, but due to a strict filming schedule and a low budget, the idea was scratched. Visual effects supervisor Scott Farrar felt that coverage of worldwide events would have distracted and detracted from the main characters' stories. A number of scientists worked as science consultants for the film including astronomers Gene Shoemaker, Carolyn Shoemaker, Josh Colwell and Chris Luchini, former astronaut David Walker, and the former Director of the NASA's Lyndon B. Johnson Space Center Gerry Griffin. The music for the film was composed and conducted by James Horner. Deep Impact debuted at the North American box office with $41,000,000 in ticket sales. The movie grossed $140,000,000 in North America and an additional $209,000,000 worldwide for a total gross of $349,000,000. 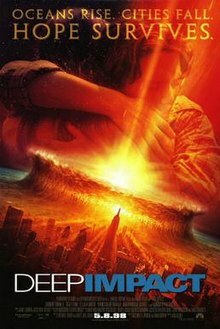 Despite competition in the summer of 1998 from the similar Armageddon, Deep Impact was still a box office hit and was the higher opener of the two. The film had a mixed critical reception. Based on 83 reviews collected by Rotten Tomatoes, 45% of critics enjoyed the film, with an average rating of 5.8/10. The website's critical consensus reads, "A tidal wave of melodrama sinks Deep Impact's chance at being the memorable disaster flick it aspires to be." Metacritic gave a score of 40 out of 100 based on 20 reviews, indicating "mixed or average reviews". Elvis Mitchell of The New York Times said that the film "has a more brooding, thoughtful tone than this genre usually calls for", while Rita Kempley and Michael O'Sullivan of the Washington Post criticized what they saw as unemotional performances and a lack of tension. ^ "Deep Impact". The Numbers. Nash Information Services. Retrieved February 1, 2013. ^ a b "Deep Impact". Box Office Mojo. Retrieved February 1, 2013. ^ Stweart, Bhob. "Deep Impact". Allmovie. RhythmOne. Retrieved August 12, 2012. ^ "Disaster Movies". Box Office Mojo. Retrieved March 23, 2008. ^ Plait, Phil (February 17, 2000). "Hollywood Does the Universe Wrong". Space.com. TechMedia Network. Archived from the original on October 12, 2010. ^ Oliver, Myrna (November 20, 1997). "Dietrich Lohmann; Widely Praised Cinematographer". Los Angeles Times. Retrieved August 18, 2015. ^ a b c d e Shapiro, Mark (May 1998). "When Worlds Collide Anew (On Location for Deep Impact...)". Starlog. New York, US: Starlog Group, Inc. Retrieved July 15, 2017. ^ "Deep Impact". The Film Journal. Pubsun Corporation. 98 (1–6). 1995. Retrieved July 14, 2017. ^ "Arthur C's Pool Of Knowledge". Saga Magazine. Saga plc. 1997. Retrieved July 14, 2017. ^ "Deep Impact - Full Cast and Credits - 1998". Hollywood.com. Archived from the original on August 10, 2017. Retrieved June 25, 2018. ^ TV Guide Film and Video Companion 2005. Barnes & Noble. 2004. p. 232. ISBN 978-0760761045. ^ Grant, Edmund (1999). The Motion Picture Guide 1999 Annual. Cinebooks. p. 94. ISBN 978-0933997431. ^ Coker, John L. III (September 1999). "A Visit with Arthur C.Clarke". Locus. Locus Publications. Retrieved May 14, 2008. ^ United States House Science Subcommittee on Space (1998). The threat and the opportunity of asteroids and other near-earth objects (Report). 4. United States Government Publishing Office. Retrieved July 14, 2017. ^ a b Leder, Mimi and Farrar, Scott. Audio commentary. Deep Impact DVD. Universal Studios, 2004. ^ Kirby, David A. (2011). Lab Coats in Hollywood: Science, Scientists, and Cinema. MIT Press. ISBN 9780262014786. ^ "Deep Impact (1998)". Rotten Tomatoes. Fandango Media. Retrieved June 25, 2018. ^ "Deep Impact Reviews". Metacritic. CBS Interactive. Retrieved June 25, 2018. ^ Maslin, Janet (May 8, 1998). "Movie Review — Deep Impact". The New York Times. The New York Times Company. Retrieved November 10, 2012. ^ Kempley, Rita (March 8, 2000). "'Deep Impact': C'mon Comet!". The Washington Post. The Washington Post Company. Retrieved December 22, 2009. ^ O'Sullivan, Michael (March 8, 2000). "High Profile, Low 'Impact'". The Washington Post. The Washington Post Company. Retrieved December 22, 2009. This page was last edited on 24 April 2019, at 15:20 (UTC).